Hey Folks! So I have been contacted by a webmaster for a neat nursing website (www.cnacareeragency.com), and was asked to be interviewed as a "Nurse writer", being that I so frequently demonstrate my creative side and nursing abilities equally. How cool is that!? Someone out there wanted to interview me. Q: Thank you for taking the time to talk with us! Can you tell us a little about your own background, and why you decided to become a nurse? A: I have a bit of a comical background. I’ve always been an “old soul” type and have been thinking about what I want to be when I grow up ever since I was five. In fact, when I was five, I was sure I wanted to be a writer. I stayed with that notion until high school where the career goal bounced around at least once a week. One week I wanted to be an architect and the next I would want to be a child psychologist. I’m the type of person that is interested in everything and fascinated by what people do. I wanted (and still want) to do everything and it was so hard to narrow it down to one thing to do for the rest of my life. That’s part of what made me choose nursing. I remember exactly the day I decided to become a nurse. I don’t have a sappy story of a family member being sick for so long and I was the caregiver, and that’s what made see I could be a nurse. No, I’m much different, in probably not a good way. I was a junior in high school and my history teacher (a horrible one at that) was out for the day and the substitute played a video about World War II. In this video was a small clip of healthcare, and nurses taking care of soldiers and newborn babies during the war. For some reason, It was right then that I realized that was definitely what I wanted to do, And I haven’t changed my mind since. I then became a Certified Nurse Aide for 5 years as I worked through college, and now have been nurse for almost three. Crazy! Q: Can you tell us about the challenges of being a nurse? What are some of the benefits? A: There are many, many challenges to being a nurse, particularly a hospital staff nurse. So much so that I see new graduates or nursing students and I want to blurt out, “are you sure you want to do this? ?” But then I stop myself because I know deep in my heart that if I had to do it all over again, I’d still be a nurse. It’s a very thankless job. Nurses run the hospital and don’t get any of the credit, rarely even a pat on the back. We work the hardest and it’s a blessing if we even get a chance to urinate or chow down on a protein bar on the run. There will be days when you as a nurse will try your absolute hardest and you still can’t save everyone, or someone will think your hardest just wasn’t good enough. You just can’t be everywhere at one time. Yet we still come back, shift after shift because of the benefits of nursing. Not only are there global benefits (general good pay, you can work anywhere in the world, there’s over 200 types of nursing jobs you can do, flexible schedule with unconventional hours), but just the benefits on shift are amazing. Once you break through that first year as a scared nurse who doubts himself or herself every day, you push into this amazing nurse leader before you even realize it. Suddenly you find an extreme high after a code blue and you helped save someone’s life. Or even something simple, where you spent the extra twenty minutes helping a patient cope with something completely unrelated to their diagnosis and they thank you for listening to them. It’s the small joys on the job that really make it worth it in the end. Q: What is your proudest moment as a nurse? A: Oh, there are so many, and probably some cliché. But that’s OK. I like to think a lot of nurses most proud moments involve a lot of “firsts”, as do mine. My first successful IV, successfully doing CPR for the first time, giving your first ACLS drug and watch as it saves someone’s life, putting your first foley in and seeing that wicked awesome flashback of urine makes you want to squeal for joy (I’m telling you, it’s the small things on the job!). Q: What is your *strangest* moment as a nurse? Some of our nurses have told us some pretty crazy stories! A: Oh boy. Where do I start? Seven years in healthcare now I definitely have a couple! There was one time I was in charge of the unit and a couple of us heard some shouts for help. Running towards it we found a middle aged man in his patient bed, with a 70 year old Portuguese woman in bed with him. At first we thought it was some sort of weird marital dispute going on, until I saw they were BOTH in patient gowns! We quickly realized that this woman was the patient next door and had crawled into bed with her neighbor! Not only did she have advanced dementia but she didn’t speak a word of English and she was trying to snuggle up with her patient-neighbor! As we tried to wrestle her out of the bed she grabbed one of our stethoscopes and used it as a lasso and whips it up over her head and is screaming. We eventually got that from her and with about 6 people were able to pick her up and slide her into a chair which we slid into her own bed next door. Then security showed up. Helpful. I’ve definitely seen a lot of weird and strange stuff, especially on full moons. We had a 30-year-old female patient who when we entered the room, found it was covered in baby powder. Walls, the floor, the bed, everything. We found her sitting on the couch sitting in the baby powder. Her excuse? She was trying to “dry up the air” as it was too humid. Another patient also thought it was a good time to cut her hair, in the shower no less and this clogs up the shower plumbing and we find water flooding into the hallway. Good times. Lots of crazy stuff in healthcare! Q: Many of our readers have expressed concerns about being overwhelmed when beginning a career in the medical field. Do you have any advice for them? A: Honestly it is overwhelming and I’m not going to sugar coat it. I’m three years in and I’m still overwhelmed. But, it does get better. The only thing I can say is to literally take it day by day. I can’t emphasize enough to not be afraid to ask questions. Especially on orientation. That is your golden time, a time where your new unit has specifically budgeted out a large block of time where an experienced nurse is there for just you and to teach you and answer all your questions. Don’t be afraid to ask the “stupid questions”, because that is your time. Heck I still think I ask stupid questions three years in, but always think- Would you rather ask a “stupid” question or make a fatal mistake because you didn’t? I put stupid in quotation marks because there really is no such thing as a stupid question in healthcare. The only thing I have to say in addition is that when you start out in nursing, research as you go! Don’t throw away the textbooks as soon as you graduate! When you encounter a diagnosis you’re a bit unfamiliar with, go home and study it and you’ll be that much the wiser the next time and might even be a resource for someone else! Just remember it will be overwhelming, so prepare yourself for it. Every shift will be different. Some will be easy, some will be hell. On those hell days, finish your shift, go home, and forget about it. Your next shift will be different. Don’t take it home with you! Q: Do you have any favorite websites related to nursing? A: I’ve always personally been a fan of www.allnurses.com, whenever I have a question I can generally find a good consensus of what I’m looking for. Also I love to browse http://www.nursingworld.org/ It’s not that expensive to join and it’s a great resource! Q: Do you have any advice for the www.CNACareerAgency.com readers who are interested in becoming nurses? A: If you’re not already in healthcare but you’re thinking of becoming a nurse, I suggest you find a way to get yourself immersed in healthcare somehow to see what nurses do on a daily basis. Many states will hire you as a Certified Nurse Aide with no prior background or class training, training is on the job. This job is a GREAT way to see what Nurses really do all day. Every nurse should be an aide of some type first. If you can’t handle being an aide, you can’t handle being a nurse. If you’re interested in becoming an aide but your schedule or life situation can’t support it at the moment, try volunteering at a hospital or becoming a unit secretary. As unit secretary, you get tons of experience learning medical lingo and the behind the scenes know-how of how orders happen, doctors names, doctors handwriting, etc. Plus it gets your foot in the door! If getting a job like this is simply out of the question, just try and find a nurse you know and ask her what a typical day is like, what are the worst and best parts? Ask if you can shadow him/her for the day. You MUST do any of these options BEFORE investing in any type of nursing school! Q: What’s your favorite novel? What are you reading now? I just read “Shantaram,” and it was AMAZING. It was, like, 1200 pages, but I’m considering reading it again. Here’s a link to the book. A: Thanks for the recommendation! I love to read! Right now I literally just finished (Like an hour ago) reading “If I stay” by Gayle Forman. I read it mostly for research on my own book I’m writing, because the book seemed like it’s a lot like mine. It was a really good read and very interesting! I have like 14 books on my nook that I keep downloading and plan to read next, and I haven’t decided which ones yet! Some medical books I have that I want to read include, “No Good Deed” by Lewis Cohen, MD., “Life Support” by Suzanne Gorden or “Call the Midwife” by Mary MacLeod. But some non medical books I’m dying to read are “Gone Girl” by Gillian Flynn, or “Reconstructing Amelia” by Kimberly McCreight. Lots of good choices!!! Q: We’re always surprised at how many nurses start blogs—there must be something about the profession that lends itself to reaching out to others. Your blog is a lot of fun—you’ve got your own bucket list, a page where you discuss the things that keep you happy and motivated, and a section where you discuss your latest projects. Do you have any advice for our nurses who are starting their own webpages? A: Aw, Thank you for such a high compliment! 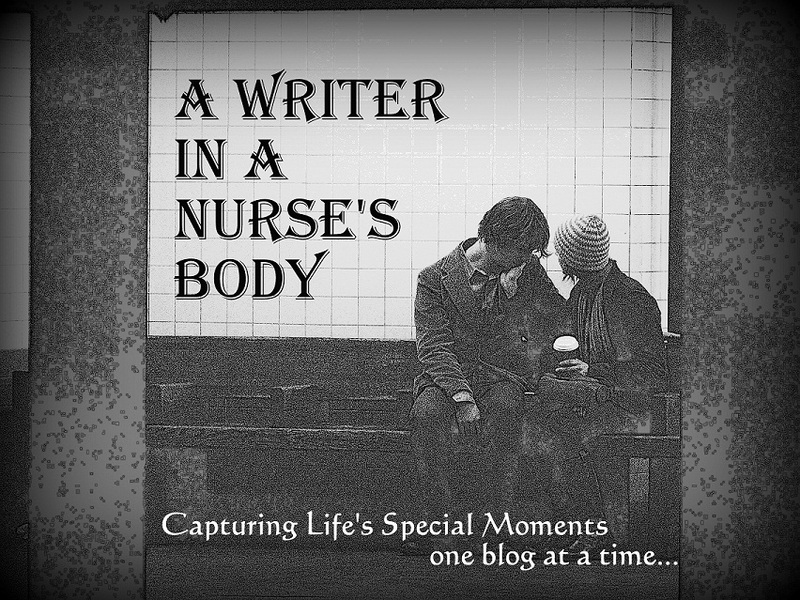 If a nurse wants to start their own blog, obviously they have a lot on their mind they want to get out to the world! That’s awesome! First things first though, do your research! Know what you’re talking about before you go blasting a medical opinion online. Secondly, find your twist. Be original. If you want to become a nurse blogger for the sole purpose of reaching thousands or millions, you must be original. Like anything else in media and fame, something must be different about what you have to say. Maybe you have a unique type of nursing job. Or maybe you want to write about one type of medical condition only that means something to you. However, if you just want to write for your own benefit and for sole documentation purposes (how I started out in 2009), then simply write whatever comes to mind and see what happens with it!! When I started my blog, I had one reader and that was my best friend. Now I have readers from all over the world and over 55K views. Who knew?! Last but not least, if you want to start a blog, I cannot stress enough that you must be very careful! If you are employed as a nurse, you simply cannot speak as freely as anyone else online. Anywhere. I am careful not to post anywhere on my blog where I work. Even with that precaution, I still won’t give too many details when telling a dramatic or funny story about a patient. If I talk about something happening in the medical community, I stay very general and don’t criticize any hospital or network. Be careful what you say! Hospitals and employers are watching everything online nowadays, don’t let a simple blog be the downfall of your career. Q: That drawing you have on your site is incredible! Where do you come up with your ideas? A: Thank you!!! I mostly draw from photographs that inspire me. Usually they are photographs I take, but not always. I am good friends with an amazing photographer that I love to draw from. Unfortunately I haven’t quite perfected the art of drawing from within my own mind. I like to draw people and settings that display a lot of people, or an emotion of some kind. I just use drawing as a portal to get from this world to another- A world of peace and happiness where I can just be myself. Q: How has nursing helped (or hindered!) your creative instinct? A: Hmmmmm….This is a great question! My Creative instinct has control of my brain at almost all times. I think if you let it, creativity and nursing go hand in hand and help each other. I use my creative side in nursing all the time. If something isn’t working or malfunctioning, I find a new way to improvise and make a solution. Nursing has further powered my creative instinct also because nursing brings forth so many powerful emotions. Nurses usually aren’t the type to let those emotions out, we don’t want others to know that we’ve been affected by someone else’s pain, sorrow or joy. So having a healthy outlet in art to pull forth and let out those emotions is a wonderful blessing I will always cherish. Q: Do you have any advice for those future nurses who want to develop their creative abilities? A: Get out there and do it! Nothing is stopping you. Nurses typically only work 3 days a week, so you have no excuse but to do whatever it is that makes you creative the other 4 days. You already have a brilliant mind if you are a nurse (or becoming one) so go make it happen. Go show the world who you are! Hello all! So this is my first “guest post” if that’s what you would like to call it. I’ve been approached by a friendly fellow internet blog-reader/blogger and asked to co-write a little bit about healthy vacationing for the modern day American family, so - here goes! Most of Americans seek vacations as a time to do and eat whatever they want, and vacation destinations cater right to that need. All-inclusive beach resorts, cruise ship 24/7 buffets, etc. But the consequences aren’t as desirable, for you and your family. So let’s think about some different options for the modern day vacationing American family! I’m a simple person and have spent my childhood and what’s begun of my adulthood with both some simple vacations (beach, camping) and a little more luxurious vacations (cruise ships, Disney world, etc.) So I will try and cater my tips towards both types of vacationers. I've gone on a number of trips over the years. I've always managed to splurge a little too much and found myself dreading the scale when I got home. That's why I started planning exercise and healthy eating habits even when I'm going on vacation for my family and me. It's important to give yourself a little room to splurge, but I always want to make sure that I'm not going overboard. These are some helpful ways that I have managed to keep off the pounds when traveling. My family loves the water. Paddleboats are one of the best ways to explore and also burn off some calories. You never know what kind of adventures you'll find when out on the lake too. Kids love to feed ducks, and it's also great just to view some beautiful scenery. It's engaging for your muscles, and if you get your family into it, you'll have burned off a ton of calories from that all-you-can-breakfast you had earlier. I luckily live near the shore and have not gone one summer without some type of beach vacation, long or short. On our beach vacations, my parents have always had a golden rule for eating: We get one meal out, and that’s usually dinner. We pack enough food for the week for the beach house to eat pancakes, waffles, smoothies, cereal, etc., for breakfast, and some loaves of bread, deli meat and some chips for lunches. We also buy lots of fruit in bulk and snack on that, with lots of water. If you choose to stay in a hotel rather than a beach house, look for a hotel that offers a fridge or a kitchen suite so you can accommodate these types of “DIY” meals on vacation rather than relying on restaurants for breakfast, lunch AND dinner. There are some valuable hotel packages out there that offer fitness centers as part of the amenities. These hotels are the best value because you can always take a break or plan an afternoon where you get in some cardio and strength training in between the amusement parks. For our upcoming trip to Orlando, it was important that we find a hotel with a quality gym. With so many places to stay, the process proved to be a bit overwhelming. With all my trips to Disney, I usually come out even- weight wise. I do recommend looking into renting a time share or a hotel with kitchen suite to make breakfast yourself rather than relying on Disney hotels. Although expensive, I do recommend the Disney dining plan for the rest of your needs. For the basic plan, you are allotted one snack, one counter service (fast food), and one table service (full-service). All Disney restaurants, fast food or not, strive to always offer healthy choices for you and your children, so that’s all up to you. Perhaps strive to order healthy options for lunch at the counter service (grilled chicken, fresh fruit, water) and then order whatever you want for dinner. After all, it is your vacation J .This type of high protein lunch will keep you going strong all day, you’re going to need it in Disney! One thing I have been able to do on vacations is to replace most of my drinks with water, no matter what the vacation. I bring water bottles along on road trips and try to buy a cheap pack of water for my family before we go to the hotel. This way we're not always in need of drinks and looking for something quick such as a soda. It's also important to stay hydrated, and water truly helps the best. As for cruise ships…..oh, boy. Buffets everywhere you turn. This puts all of the decision making on you. Perhaps discuss a plan with your ship-mate vacationers or your family before you board on what your food intake will be like. Perhaps you can pick in advance what days you plan on doing the buffet and which days you won’t. When you do go to the buffet, try and stick to a 2 plate rule. One for your entrée and one for your dessert. Try and adapt the mindset that buffet should not stuff you to the point you must roll out of the restaurant, but should merely just offer you many choices to make your whole family happy. Two plates! I try to avoid buffets whenever possible, but when you're on vacation, it's inevitable that your family will want to head out to the nearest lunch or dinner buffet. I stay healthy by only filling my plate once, and while I may pick up a few treats, I try to stay away from the really rich foods. In addition, the next day I always go for lighter, vegetable meals to balance out the food that I eat at the buffet. Despite these tips, it really is all up to you in the end. You probably wouldn’t be reading this entry if you weren’t at least a little concerned for your food choices and overall health. So take these tips to mind and go forth making your own smart choices! WNB and guest co-writer, Kendra. You'd think that by now I may have learned my lesson, but alas, that is false. When self scheduling as a nurse, I always forget to check when the next full moon is and almost always find myself working over the full moons. 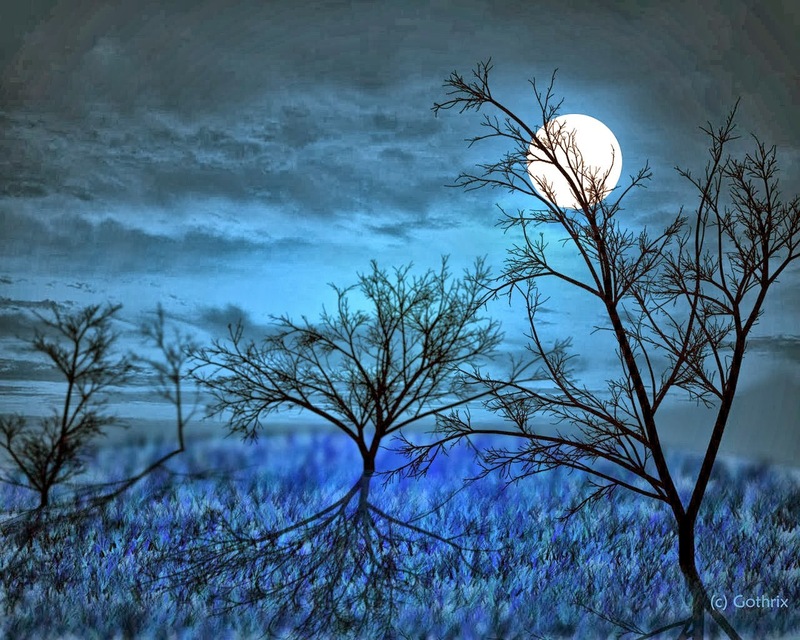 Not just one shift, or two, but three fabulous shifts all in the spree of the full moon. And this past one was extra special, being the lunar eclipse last night. Patients were lining up outside the hospital 5 days ago for this full moon. 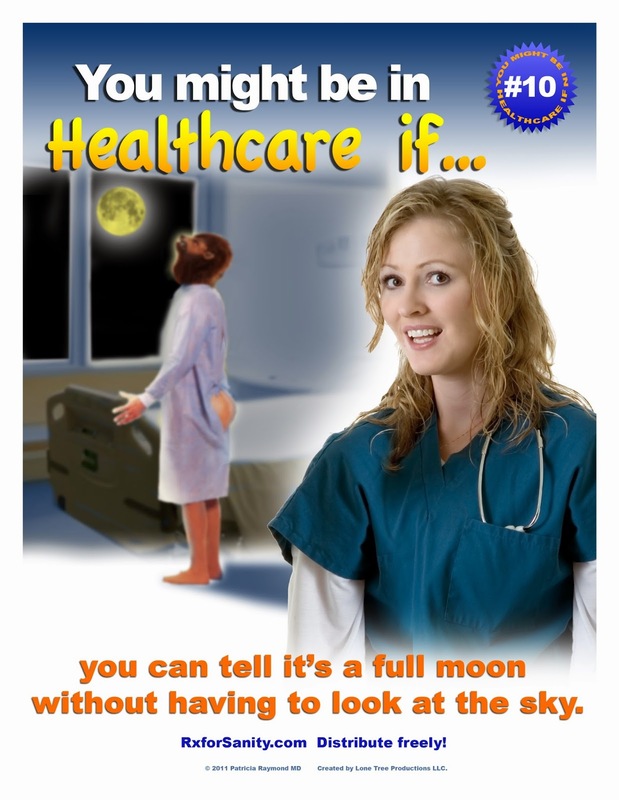 Now I'm pretty sure everyone knows that full moons make patients go crazy in hospitals. But it's not just that. Normal patients start acting crazy, and the crazy ones just get even crazier. It's like they all gang up and conspire with each other on how they can plan the most eventful full moon shift ever. And that's not even it. Equipment acts up. You'll hear the strangest noises come out of your machines and equipment, or all of the sudden it stops working, or all the sudden your hospital phone won't work anymore. And things come alive and get lost and walk away. You'll be looking for your bladder scanner and turns out its 4 floors down and they have no idea how it got there. And then there's other just weird stuff, like your patient comes in with one thing and you're dealing with a completely different, extremely time consuming issue. Great fun. So, within the past couple shifts I worked over the full moon, these are the top 15 reasons that I hate working full moons. 1) I asked my patient if she could tell me her full name. She tells me, "I'm Italian! Do you think I know not my name!?" 2) A patient on the floor tried to convince me he was legit abducted from aliens, I wasn't good enough to have been abducted, and he was looking to speak with a scientist. But I was definitely not the scientist. 3) Same guy as said above proceeded to injure staff and scream down the hall, wrestle people in the hallways, despite 5 doses of Ativan, 2 geodon, and 1 haldol. 4) My patient tells me when I get on shift, "I just had diarrhea." Me, "Ok.....thank you....for....letting me know..." patient,-"yeah...its still in the toilet. I need you to look at it." Me,-"why?" patient, "I think I swallowed something. Can you tell me what those colored things are?" 5) one of my IV poles presented with "ERROR" on the screen. Despite me being tech-savvy and familiar with the IVs, I have not only never seen this error message, (or the horrifying beeping eradicating from the machine), but I couldn't get it to turn off, either. The best part is it wasn't even on in the first place. 6) Call light goes on, about 330am. Me, "Hi, how can I help you?" Patient-"The music! I turned on the music box and it kept ringing, and ringing, and I couldn't get it to stop, but then it stopped. Do you hear the music now?" 7) my (previously normal) patient tried to pull out her NG tube and foley. At the same time. 8) same patient, turns out her NG tube was draining poop. Because, why not? For my fellow nurses out there, you know how rare this is, but it definitely happens. lots of fun. 9) The giving nurse tells you, "the patient came from home taking ThisWeirdDrugIveNeverHeardOF but were not giving it to him here because you can only get it from canada. WTF. 10) I take a chest pain admission and the patient speaks ONLY (literally) Italian. So does the wife. And the son is trying to order pizza to the hospital room, and only speaks Italian and is trying to ask me (In Italian) how to order pizza. I only know this because he's shouting PIZZA and the 8 year old grandson is translating into English for me. Turns out the patient has no chest pain, he's severely constipated. So you know, pizza should be good for that. 11) Same patient as above was angry that we could not get his Italian drugs imported from Italy for him to take during his stay with us. Because that is extremely unreasonable. 12) I had to explain to said patient that I had to give him a laxative suppository. Since I don't speak Italian, I tried to do this through gestures. That Involved a lot of gestures I hope to never have to use again. 13) One of my dementia patients told me he wanted his Easter bread. If he didn't get his Easter bread, God would strike me with zebras and the patient was going to leave and go to the hotel next door ( room # 745 specifically) so he could get his Easter bread. 14) Patient asks me for Morphine. I told patient she doesn't have an IV, how am I supposed to give her morphine? She told me I can inject it into her brain. 15) Patient asks me for food at 3:30 AM. I offer crackers. He asks for an egg sandwich. I tell him kitchen is closed. He says OK how about Cornbread? Ummmm, no. I don't have cornbread. He then asks for fresh fruit. I tell him again kitchen is closed but I can give him crackers. He said he's not hungry enough for crackers but what about a Milkshake? 16) The nurse before you tells you she charted she gave medicine but really didn't and can I please call the doctor to see if he really needs it? Um no. No I cannot do that. 17) My 93 year old patient asks me what a Hookah is. 18) My 36 year old female patient tells me she hasn't urinated in the past 14 hours because she doesn't like to use public bathrooms and asks me what I can do for her. I can't make this stuff up you guys. Seriously.